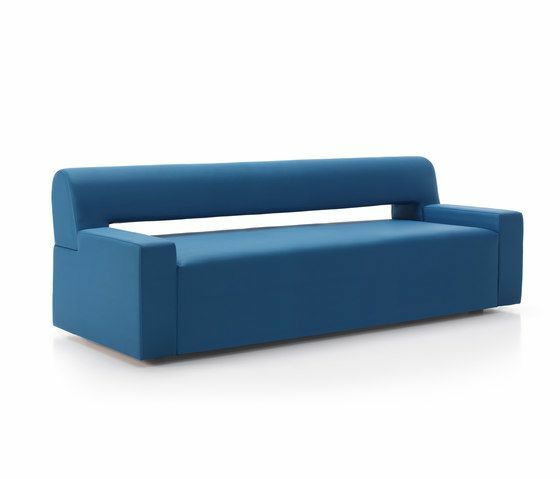 A sofa with dynamic shapes and strong personality and recognized immediately. A combination between classical and avant-garde design of great simple shapes. An ideal piece for contract environments, waiting areas and lobbies. MATERIALS: – Frame made with solid brushed pine bars and MDF boards. Suspension made with NEA elastic webbing with 10 year guarantee. All covered with laminated foams of 30 kg/m3 and blocks of “extra hard” 40 kg/m3. This gives the necessary firmness to this type of shapes. – The integrated seat cushion is made with a large foam block of 32kg/m3 density. All covered with a thin silconed fiber layer, with foam support, sewed and not glued and upholstered directly to the frame. This previous cover to final upholstery gives consistency and soft touch. – Leg p-75 chromed metal, p-42 wood.